Except for The Ragtime Robin, the arrangements heard on this disc have never been recorded before. 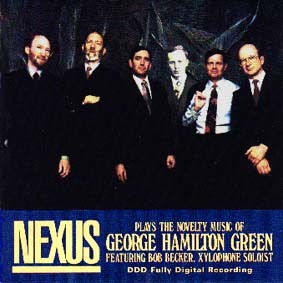 The dates of the compositions themselves span George Green’s spectacular career as a recording artist for virtually all of the major record companies of the acoustic era (which lasted until the introduction of electric microphones in the late 1920’s). The various styles comprise the most popular dance forms of the notorious ‘roaring twenties’. Of special interest is the sound of the rare Deagan Nabimba, an instrument manufactured for a brief time which made use of buzzing membranes in the resonator pipes. The characteristic sound of this instrument, which can be heard in the trio of Rajah and throughout Spanish Waltz, imitates the wonderful piquant timbre of the famous marimbas of Central America. Also very rare is the Deagan Artist’s Special Xylophone No. 268, a mammoth five-octave instrument. The low range of this xylophone, featured in An Indian Story and The Humming Bird, produces a unique and mysterious sound.